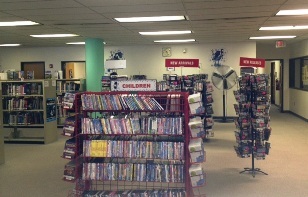 The Video Services Department is located on the second floor of the library, on the right, past the Children’s Department. We have approximately 10,000 entertainment and educational DVDs and 300 video games and 600 Blu Ray Disc, which can be borrowed using your library card. You can search our collection the same way you do for other kinds of materials, through our online catalog. Newly released entertainment titles can be borrowed for a period of 2 nights. Older entertainment titles, educational titles and video games can be borrowed for 7 nights. For entertainment DVDs/Blu Rays/video games there is a $1.00 rental fee. 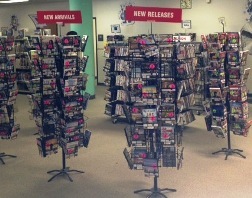 Multi Set DVD’s are $2.00 for a 21 day rental period. Educational DVDs/Blu Rays are free to borrow. A $2.00 per item fine will be assessed for each day that any item is returned late. Any patron under the age of 18 must have a permission card signed by a parent or guardian. For more specifics on borrowing, please see our Policies and Procedures page. To fulfill the wishes of our patrons, Blu Ray Disc has been added to the collection. The collection has grown tremendously over the past couple of years. Currently, there are 600+ titles in the collection. The rules for borrowing Blu Ray are the same as DVDs. Stop by to browse the collection!